Starting today, there will be greater number of posts on the Indian economy. India is home to one of the largest automotive markets in the world. From luxury car makers to producers of automobiles for the masses, the who's who of the global automobile industry is wooing the Indian car consumer. However, as this FE graphic shows. passenger car sales went down by a little over 12% in December last year over the corresponding period in 2011, despite auto companies running a host of incentive schemes. 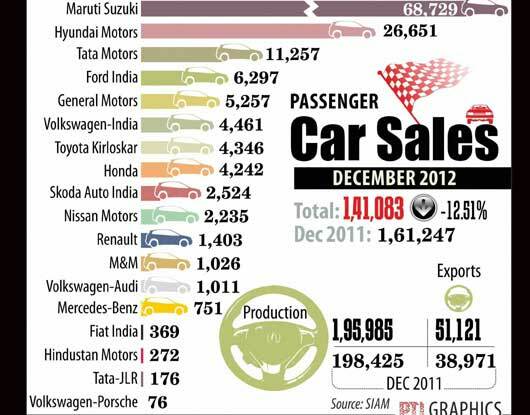 I wish I could understand the effect of this 12% drop in car sales on Indian economy. i didn't know that india produces this much cars. Can any one tell me that is there any on the web classes for Search engine marketing, because I wish for to learn more on the topic of Search engine marketing.